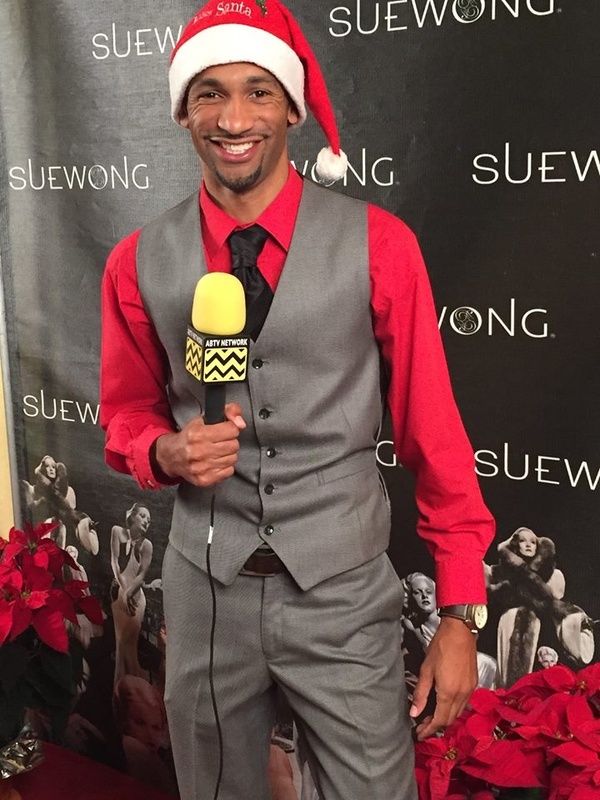 On-camera host and actor Kevin John gets ready for his close up as a correspondent for AfterBuzz TV. I had the pleasure of hearing Sue talk about her gorgeous and historical estate. It was a great experience to hear about all the legends who have stayed at the Cedars. 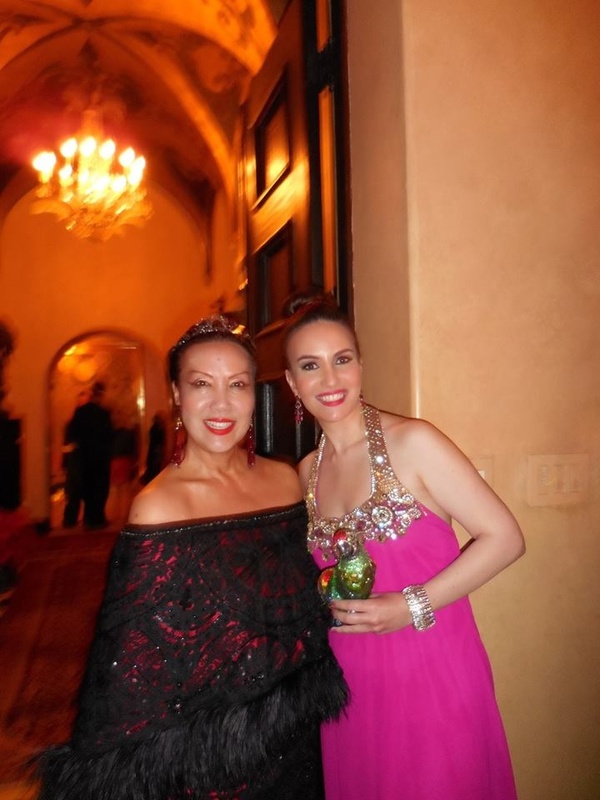 My hair is by Evita Von Dee and makeup by Javier Basto, dress by Alka Vora, parrot clutch by Judith Leiber, jewelry by Style and Co. and the Mitra Collection. 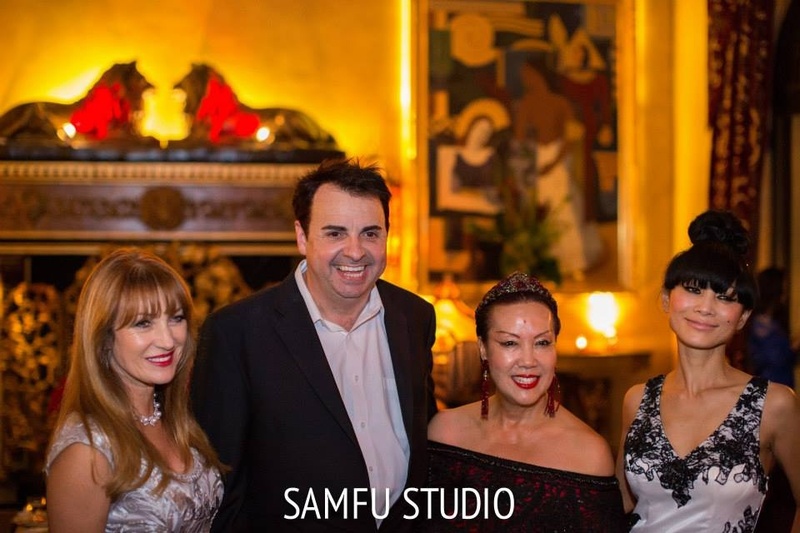 On December 12th, internationally renowned and award-winning fashion designer Sue Wong held a holiday party in honor of Sandro Monetti’s birthday at The Cedars, her opulent and historic hilltop estate. Monetti is the west coast director of BAFTA-LA (British Academy of Film and Television Arts). As guests stood in the center of her grand foyer, Sue said,” This is one of the power points of Los Angeles. It’s the reason why various famous artists have always been attracted to this house. And it’s why so many famous people in Hollywood continue to come here.” She acquired this estate a decade ago and tirelessly worked on it for several years to restore it to it’s original splendor. 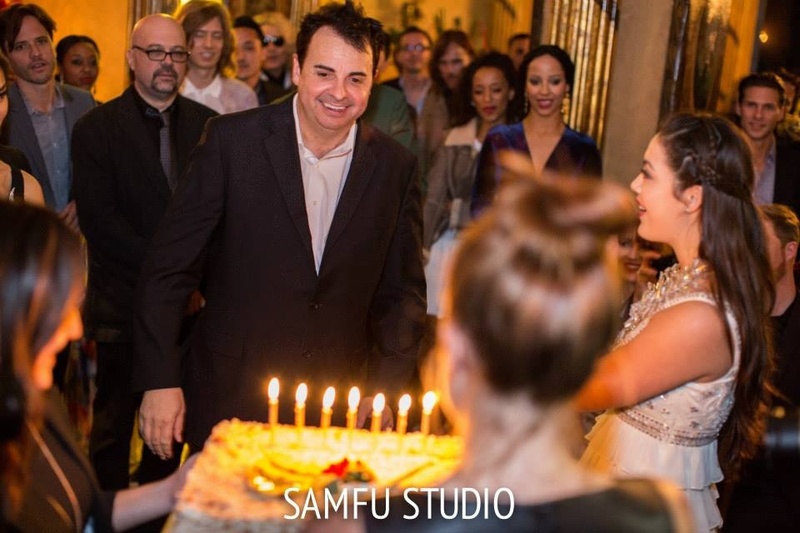 “I feel like every time I come here, I’m stepping into Hollywood history and Sue is such an amazing hostess who throws such lavish parties,” added Monetti. The party was an amazing evening full of great music, dancing, food and drinks (even tasty Sue Wong red wine!) with stars such as Jane Seymour, Kelsey Grammer, Ronn Moss, James Frain, Bai Ling, Loretta Swit, Carolyn Hennesy, Grammy award-winning composer/musician Omar Akram, rockers Chris Pitman from Guns N’ Roses and Steve Cooke, dignitaries Ambassador Liu Jian, China’s Consul-General to Los Angeles and his wife Madame Ambassador Chen Xiaoling and former British Consul General Robert Pierce. Many other entertainment notables attended, including Academy Award screenwriter David Seidler (“The King’s Speech”), writer and producer David Marconi (“Live Free or Die Hard” and “Enemy of the State”), the creator of Baywatch Michael Berk and Sandro Monetti of course, as well as Mr. Golden Globes himself, Lorenzo Soria. 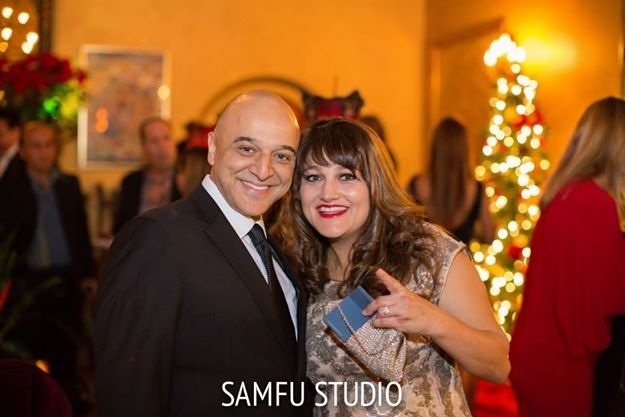 Rounding out the event was a large crowd of fashion world VIPs, established musicians, esteemed members of the press, and Hollywood socialites. Nothing quite matches the Cedars in terms of scope and design. 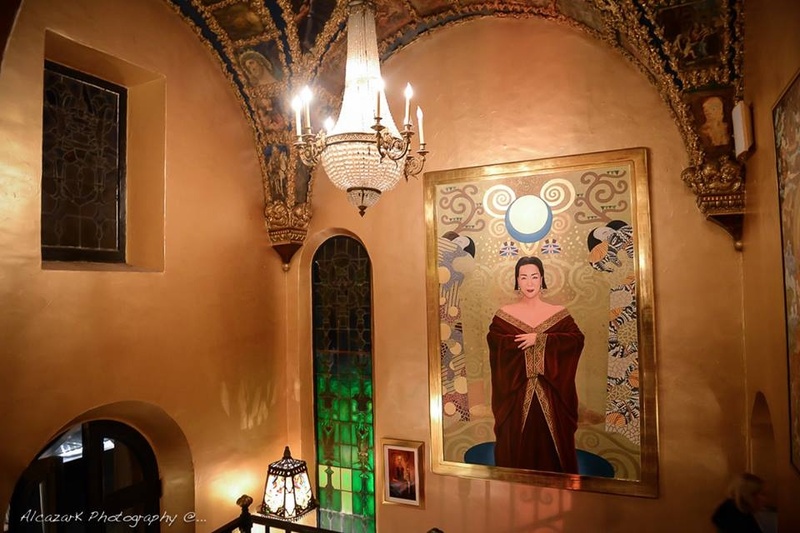 A beautiful portrait of Sue by artist Jaime Hodgers, reminiscent of Klimt for its theme and use of gold, graciously welcomes visitors upon entry. Sue’s stunning 10,000 square foot estate has a great history behind it. Built in 1926 for film director Marcel Tourneur, “legendary silent film star Norma Talmadge lived here with her husband Joseph Schenck in the late 1920’s and she was the inspiration for the Norma Desmond character in Sunset Boulevard. Schenck founded 20th Century Fox and was the second president of United Artists Pictures, which was founded by his friends, Charlie Chaplin, Douglas Fairbanks, D.W. Griffith and Mary Pickford,” said Sue. “Industrialist Howard Hughes also lived here and played the piano in this magnificent solarium behind me,” added Sue. Iconic musician Jimi Hendrix was a former resident, and his bedroom with an alcove space is among one of the many beautiful suites in this mansion. 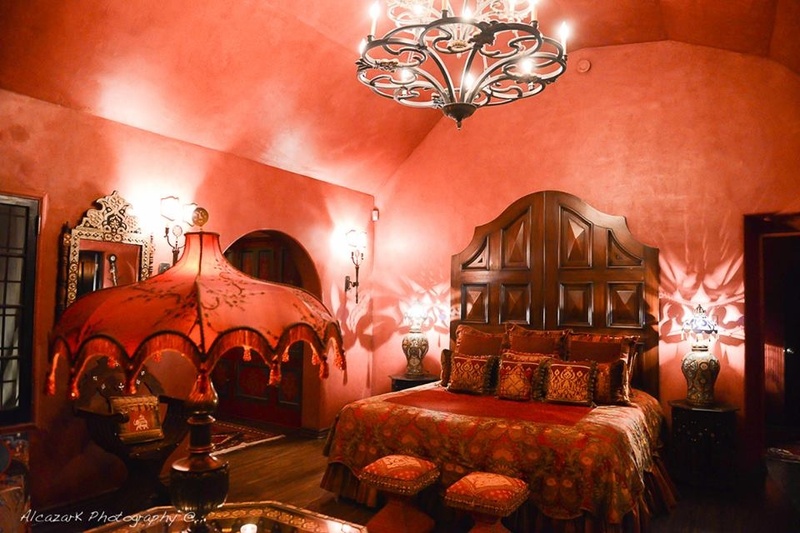 Appropriately named the Jimi Hendrix suite, this room is also called the Moroccan room. This legendary performer was inspired to write “Purple Haze in his room, which makes sense giving the burgundy color scheme throughout the room. This estate in the hills overlooks the beautiful Los Angeles skyline. How apropos that a designer like Sue, whose timeless and stylish gowns, that are known for bringing back the glamour of Hollywood’s golden age, should reside in such a historic and scenic mansion. “I feel like I live in a museum and this is really a great place to be,” said Sue.